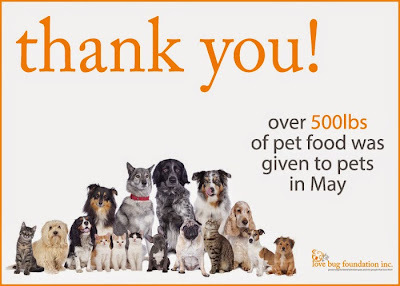 500+ lbs of pet food distributed in May! | love bug foundation inc.
500+ lbs of pet food distributed in May! We are excited to let you know that for the month of May we distributed more than 500 lbs of pet food to families in Clayton and Fayette County. To be able to help these families has been a rewarding experience and we look forward to the coming months. If you know of someone who could benefit from our pet food assistance program, please send them our way. To all of our donors who have made this possible, THANK YOU!